Special Olympics Illinois has its own version of “A Christmas Story.” But this story has to do with a girl (two girls, actually), a horse and a Christmas surprise. It all started at about Thanksgiving time 9 years ago. 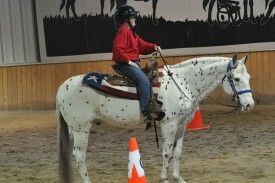 Special Olympics equestrian coach Tom Walmsley of Decatur was attending a Ponies of America event in Florida. He was chatting with Bob and Sally Hurley of Macon, Ga., about a Special Olympics athlete he worked with in Illinois named Sarah Boys who loved horses and competing in Special Olympics equestrian competition. 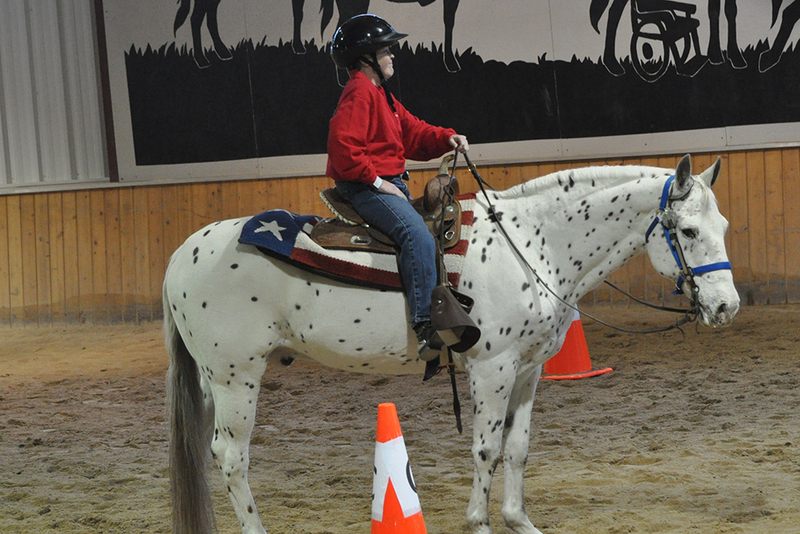 Tom told them how courageous Sarah had been, going through more than a dozen surgeries for hydrocephalus (water on the brain) and cystic fibrosis, but always pushing herself to get back to training for Special Olympics sports – especially equestrian. Being around horses and her fellow teammates on the Dream Catchers team always made Sarah feel better. Sarah also was a spokesperson (Global Messenger) for Special Olympics, inspiring others to do their best and never give up. The Hurleys had an idea, but before they acted, they wanted to speak to their daughter, Anne, who was studying at University of Georgia and planning to go into veterinary medical research. They told Anne about Sarah and that she didn’t have her own horse. 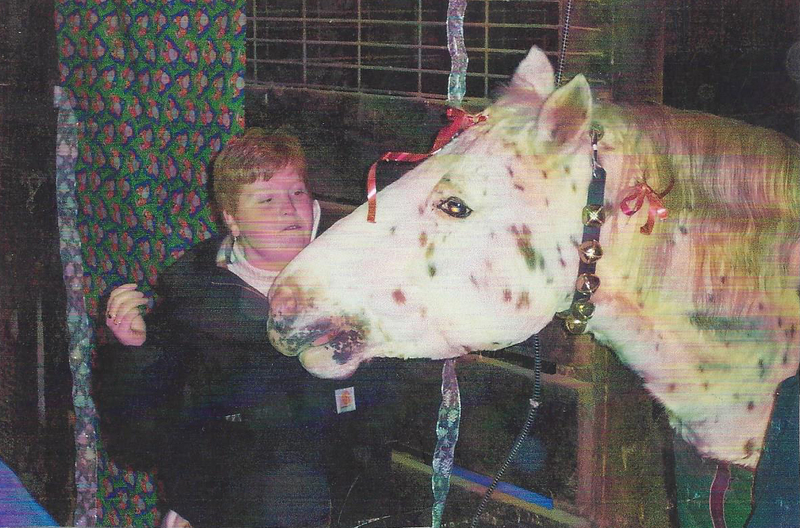 It just so happened that Anne had a leopard (spotted) pony named KS’s Stand Me Grand (SM for short). SM was not getting the attention he needed because Anne was so busy with her studies. They came up with a plan and called Tom, who thought their idea would be a grand Christmas surprise for Sarah and a wonderful dream come true. A special transport – one that usually carries race horses – was called to the Hurley home and Stand Me Grand was ushered on board. Back at Rocky Lane Farm in Decatur, Tom Walmsley and friend Ken O’Hara were decorating a special stall with wrapping paper and bows, getting ready for the new arrival. 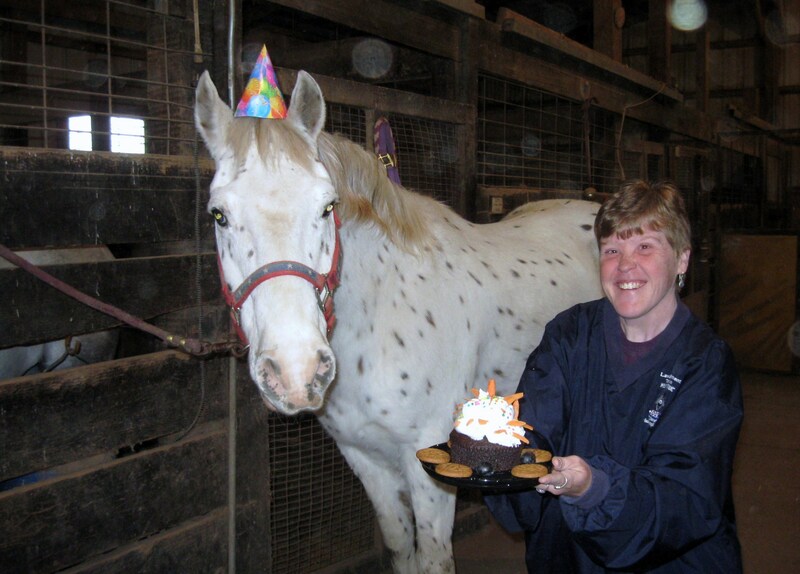 On Dec. 24, 2004, Sarah came into the barn to help feed the horses Christmas Eve treats when Tom, her parents Paula and Bill, and 20 of her friends and family said: “Surprise!” and pointed to Sarah’s new horse – Stand Me Grand! “She stood there for 10 minutes in shock,” Paula Boys said, in recounting the story. Since that time, Sarah and SM have become great friends as well as Special Olympics training partners, working on the various skills involved in competing in working trails competition. But that isn’t the end of the story. A few days after the Christmas surprise, Anne Hurley arrived in Decatur and spent three days with Sarah and Stand Me Grand. 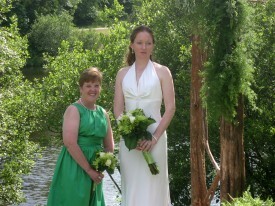 The two redheads quickly became “sisters.” In 2010, Sarah had a chance to visit Anne in Georgia – as the maid of honor at Anne’s wedding to Joel Bacon. Since then, Anne and Joel have given Sarah two more special gifts – a “niece and nephew.” The Hurleys are very much a part of the Boys family, keeping in touch every chance they get. Watch video of Sarah and Stand Me Grand from the 2013 Fall Games.